LEGOLAND® Discovery Centre, where families with children aged 3 to 10 can enjoy a world of creativity, colour and building fun in the ultimate indoor LEGO playground. With features including global and local landmarks made from over a million LEGO bricks in MINILAND® to fun and exciting LEGO themed rides: Kingdom Quest and Merlin’s Apprentice. Watch as your favourite LEGO characters come to life in the 4D Cinema. Then get hands-on with the thousands of LEGO bricks in themed build and play areas where kids imaginations can run wild with the endless possibilities that LEGO offers. 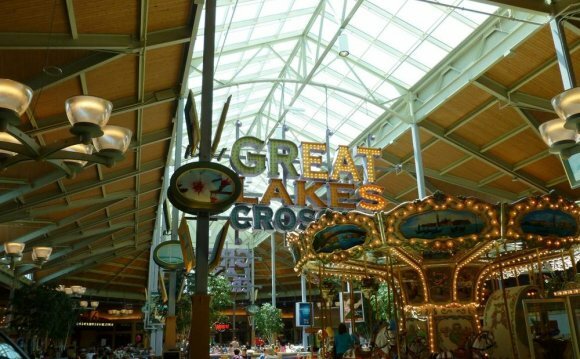 Pepsi is the official soft drink partner of Great Lakes Crossing Outlets. Ticketmaster is the world's leading ticketing company. Shoppers can purchase tickets to a wide range of entertainment options including sports, music, theater, arts, and family events. Waste Management, based in Houston, Texas, is North America's leading environmental solutions provider with comprehensive waste management services that include collection, transfer, recycling, and disposal. The company is a leading residential recycler with customers ranging from small communities to large businesses. To learn more, visit or www.thinkgreen.com. Founded in March 1995, Outdoor Adventures is a Michigan based corporation dedicated to servicing Michigan families. Outdoor Adventures has put a lot of hard work and dedication to provide some of the finest camping resorts anywhere.